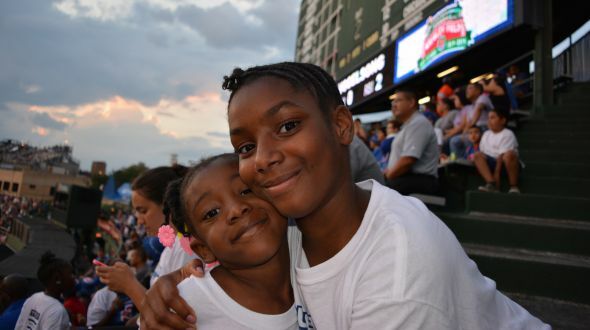 Urban Initiatives – Summer Campers have a Ball at Cubs Game! Summer Campers have a Ball at Cubs Game! What a night at the ballpark! For the final stretch of Urban Initiatives’ partnership with the Cubs on the Move Fitness Trolley this summer, the Cubs generously invited over 200 UI participants and their families to watch the Cubs take on the Giants on August 19th. The kids from Beidler, Gunsaulus, Kozminski, and Lloyd were welcomed to Wrigley Field as VIPs; they were each given a Cubs bucket hat and ushered from a back gate onto to field to walk along the historic, ivy-covered outfield. On the way they were able to watch All-Star Anthony Rizzo taking batting practice. Michael, a fifth grader from Kozminski, exclaimed, “this could be the best night of my life,” as he took his seat in the right field bleachers. The Cubs scored two early off a Rizzo home run and picked up a victory in the five inning game that was called early due to rain. This summer our kids learned the importance of playing every day from the Cubs. Thank you to the Cubs for giving them the opportunity to watch the big leaguers play America’s favorite pastime – baseball! Special shout out to Jennifer Dedes-Nowak, Connie Falcone, and Nicole Buzais for a truly amazing summer! Thank you also to all of our kids, families, and coaches for coming out to the field trip! You can check out Photos HERE!